I have a peripheral memory. Significant events dissolve into the horizon of my mind, while irrelevant details continually wash ashore like they were the armor of Pericles' father caught in fishermen's nets. In Shakespeare's tale, Pericles, King of Tyre, has just been tossed by the waves of fortune. Shipwrecked in his own land, he is fleeing the answer to a riddle he has solved. The answer is that the princess he wants to marry is sleeping with her father. Hesitant, he does not answer. Fearful, he flees. His ship bursts upon the rocks. And he is reborn a protagonist of his own struggle on the bright beaches of the Mediterranean. Before he can begin to move, he has to curse the only thing he can see prone on his back, which is the morning stars, the first reminder upon waking, of his own existence on this earth. "Earthly man is but a substance that must yield to you." He tells them. He thinks he is made of material less valuable and real than the stars, like he is living as the reflection of a pool of water and is speaking now to his real image, peering down at him from above. Try as he might to disturb his own form, he reforms in to what transpires above. This is, of course, wrong. Who could have guessed the stars, made of simple materials, were the combustion engines which produced him? At this moment in despair, the fishermen greet him, casting their nets, and pull tangled among them the armor of Pericles' father, a strange artifact, making a singular mark on the sand smoothed by the wash of fresh waves. Of all the details which could survive the eradication of his past, here is a mark of comfort and strength. Remembering the riddle he has unraveled, he seeks to loosen the armor from its nets. After the death of my own father some eight months ago, I have witnessed the arrival of all of his artifacts upon my shore, owning, in part with my siblings, his house, his cars, his psychiatry practice, his books, his letters, his pens, his pets, his shoes, his crs, tapes, folders, binders, printers, files, desks, lamps, carpets, taxes, skis, debts, fixtures, pictures, binoculars, subscriptions, etc.. The burnt materials the stars produced eventually learned to produce Pericles. When we learned to make things by means of combustion, we made vcrs, tapes, folders, parkas, printers, pictures, places, rings, subscriptions, etc. When each article rolls up to my feet, I feel the same feeling that Pericles must have first felt when he saw his father's Breast plate, how funny, that that, of all things, survived. Tyre is famous for having valuable items fished from its shores, most notably the murex, a large mollusk that grows happily in those waters, and when crushed yields a magnificent purple dye used to stain the clothes of important people in the ancient world. The clever product placement of Tyre's founders, the Phoenicians, is the reason we consider purple and blue the royal color. It was their vast network of trading ships that commodified the dye in to an inescapable mark of opulence and status. As a result, if a fisherman was to ever find a single murex enmeshed in their nets, it meant for him a bloom of wealth. Galactus too, experienced a fate similar to Pericles. In Marvel comics, Galactus was the only one to survive the obliteration of the universe which existed before this universe. Though he rarely elaborates on the experiences of his former life, it was somewhat of an age of Saturn, where Titans of immense power and size lived unimaginable lives. He is the last of these terrible beings, buried and asleep in some way, only to awaken in a fresh, pettier universe, still gripping his foreign strength on new shores. Somehow, it is demanded of him that he constantly devour planets to sustain himself. He does this by hooking up strange cables from his ship to the surface of the world. Then, as the planet disappears in smears of yellow and orange, he siphons off its energy. Occasionally, for no good reason, he will choose a herald, granting them a fraction of his power to inform inhabited planets of their imminent destruction, and to find for him suitable meals. His first and most famous herald is the Silver Surfer, who nobly accepted servitude to save his native planet, Zenn-la, from Galactus' appetite. Like all the heralds after him (with perhaps the exception of Morg), the Surfer felt the pangs of living an existence at the headwaters of annihilation. The Silver Surfer chose Earth as fit for consumption, yet betrayed Galactus for its survival, after being affected by our world's myriad experiences and people. As punishment, it was on the Earth the Surfer was trapped from the late sixties in to the early seventies. The fraction of Galactus' power granted to his heralds is called "the Power Cosmic". Pericles, if he was really a proper Greek of his mythic era and not a Shakespearian character, would be more apt to call his father's armor cosmic than the stars his head was pointed at, since the word Greek word cosmos referred only to the careful ordered decoration a craftsman would give to something precious like a cup, a plate, some armor, women, horses, or armies. Only much later would the sensation of owning something rare, cut patterned, and ornate, be abstracted to the sensation of living in the world as a whole. Though "the Power Cosmic" has nothing to do with order or the ornate and instead hints at some grandiose universal secret, the Silver Surfer and many other heralds gleam like they were metal plated trophies, or strange objects of desire. Galactus, like the word galaxy, has the same root as "lactose" and simply means milk, referring to the milky spray that is the stars spread wide, and the big tittied fertility goddesses that maybe made it that way. Yesterday, Paul and I went to the Baltimore Comic Convention. When it comes to comics my peripheral memory is at its worst. The expanse of the Marvel universe, in all its inane complications, rises in my mind as clear as the invisible woman reappearing. Suddenly I begin to think about the heralds of Galactus, Peter Parker's friends, and the X-men's enemies. It's like a gust of litter blew down my street, newstock printed with important fictional news from my childhood. There are feelings that accompany the commodities of my childhood, part stupid delight, part gag reflex. Today, I'm in New York City, sitting in the darkened skyscraper that's Paul's new building. I just drove him up. Paul's next to me trying to steal wireless internet from his new neighbors. We're roughly in the neighborhood of the Baxter building, the Fantastic Four's old headquarters where Galactus stood, a giant between the buildings jutting out beyond my window, as the Silver Surfer betrayed him. I'm thinking of all that purple ink (Galactus wore a purple suit), and what I could have traded for the pigment dots that peppered his costume. Who doesn't know of the Ultimate Nullifier? It is the device that Reed Richards, head of the Fantastic Four, traded Galactus that terrible day of reckoning that occurred during Fantastic Four #50. In exchange, Galactus promised he would spare the earth. This, in some way, seems to me like Manhattan traded back to the Indians for the same handful of beads. "We kept them safe for you all this time because we knew they were more valuable." What does it do? Well, it obliterates anything you can think of, then it obliterates your thought, then you. So you can only use it once, but it can be on anything. When used, it emits a slender beam that angles its way through the universe to share that suicide impulse with its victim. The impression one gets is like a math problem, canceling out both sides of the equation. Don't protect me from the truth. I know how close you came to walking away. But now, with the chromatic splendor of the new comic spilling through your ocular dimension, that trembling in your loins tells you yes -- you will stay. I always loved those posters of Mickey Mouse "through the years." You see how abbreviated he was at his inception, and how various marketing efforts guided his design towards bigger eyes and a calmer, more bourgeoisie attitude. In the 80s, he sometimes donned sunglasses and a sharp powder-blue blazer. Anyay, I love that stuff, and we're going to do something like that today. Besides, I'd like to provide a little insight and explanation for those of you wondering why we're so late with this one. The Ordinary World - The more recent comics have all started with a page of sketches, like this one. I draw in the same format as the actual comic will eventually occupy as a way of getting comfortable in that space, to begin to think within those parameters. Sometimes the sketch starts to look a lot like a comic, but it remains a jumble without narrative flow. Crossing the First Threshold - This is the comic in an early state. You can see that I've spent a disproportionate amount of time on the end (my favorite part of this one), which is something art school tells you not to do because generally everything gels more nicely when it develops more or less evenly. It's like a relationship: it works best when both people are on the same page, when their thoughts and feelings change together. Approaching the Innermost Cave - More of the comic is filling in, and I'm adding more colors, although not very gracefully. The drawing looks stiff; I'm relying on obvious perspectives and poses. The panel layout was supposed to resemble the city skyline. I wanted that rhythm to emerge, for the reader to get in synch with it, before it finally takes a recognizable form in the buildings at the end. At that moment, I wanted a feeling of realization and recognition, as abstract thoughts suddenly solidify into something familiar and comforting. The Belly of the Beast - This is pretty much the finished comic, although certain things, like me in the first panel, and Dale and his wife, who were to be digitally inserted on the bleachers in post-production, are still missing. That I would hold off so long to add some detail, rather than let it emerge organically with the rest of the drawing, again shows my hesitation and stiffness which ultimately doomed this version to ugliness. Paul called me from New York after seeing a draft, and gave me some pointers. The narrative sequence is really confusing at the beginning. Also, the colors are horrendous. This is the comic we would have posted on time. I hope you can see why we did not! The Return Voyage - Some panels are redrawn. The Theorist's Archetype - The panel arrangement starts to shift around a lot. 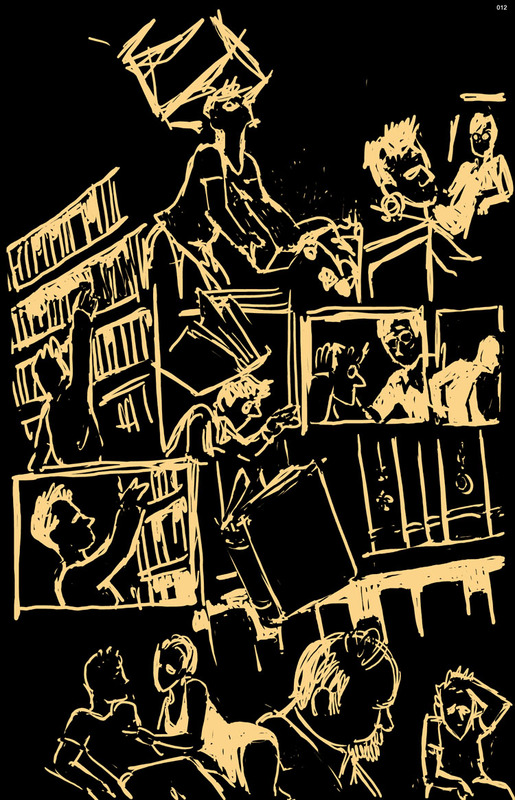 I got the idea that the books that hit Dale on the head could fall out of spaces in the comic, equating the comic panels with the bookshelves, equating the bookshelves with the city, equating everything in a rampage of joyous thematic restructuring. I called Dale and told him excitedly that the comic is starting to look very acid-trippy, although I don't do drugs. Three years later, it was done. Thank you to family, friends, and intrusively helpful strangers who offered support through this difficult time. Please come back next week for a new comic!